Last year about this time, the USCG changed the US Inland Navigation Rules and their Annexes. These are the rules that apply inside most point-to-point lines across coastal bays or inlets leading to the ocean—notable exceptions are all of Puget Sound, AK, and HI waters. There has been little notice of these changes despite a couple details of interest to sailors. Knowing these details could save you up to one hundred dollars; not knowing them could cost you a couple hundred dollars. The official discussion of the changes is an interesting insight into the rules themselves. The goal of the changes was to bring the wording and format more in line with that of the International Maritime Organization (IMO) Convention on the International Regulations for Preventing Collisions at Sea, known as the COLREGS, or in many places simply the International Rules. Another goal was to address recommendations made by the Navigation Safety Advisory Council (NAVSAC), which we are proud to say one of our past Starpath instructors, Pamela Hom, was a member of for several years. The new subtitle reflects the handbook nature of the new publication in that several documents often needed by professional mariners are now in this one book. The book’s cover design is unchanged but for the new title. The inclusion of the edition date in the title might portend an easier way to tell when new editions become available, but that is just a guess. Previously, it was difficult to tell if you had the latest edition. Following the recommendations of NAVSAC and other professionals, the proposed changes where published, and the public invited to make comments. Apparently only ten public responses were received, addressing 49 specific points. They were described as mostly favorable, with most addressing the key issue of nomenclature, ie use of “section” versus “part” versus “subpart” versus specific CFR (Code of Federal Regulations) article reference. This aspect has definitely been improved, but anyone looking at this book for the first time would have to wonder what it looked like before improvement. In a sense with the new handbook content and ubiquitous reference to CFR article numbers, ie 33 CFR §83.25(d)(i), the book itself looks more complex now than it was. But not to worry about that; there are only 18 half pages of content we need to know to be safe in most encounters, namely the Steering and Sailing Rules—though needless to say, proper identification of lights and sounds could also be crucial at other times. Flash cards or special pubs can help with that. First the easy part, which does not affect sailors unless they are testing for a USCG license. WIG craft rules are now all the same for Inland and International waters. WIG rules used to apply only to International Waters, so this must be looking ahead to seeing more of these “vessels” here. 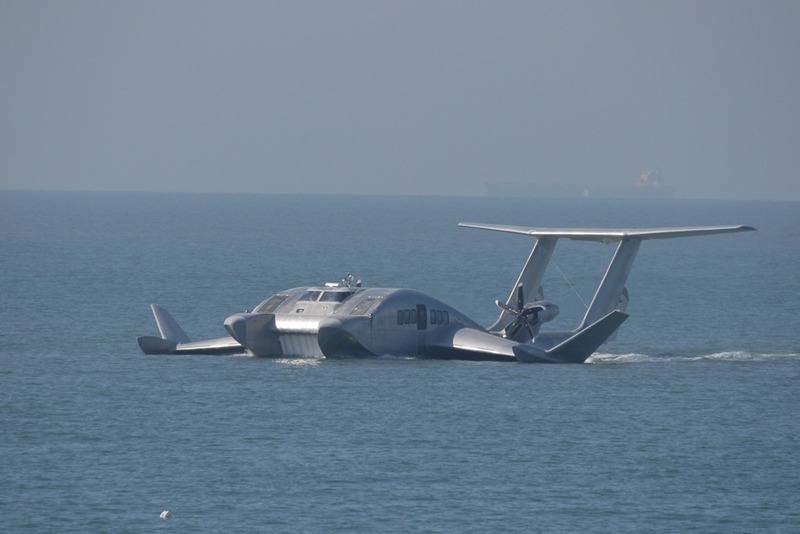 These strange boats that can fly are more popular in Asia and Europe than in the US. They went on to point out that the skippers of only 14% of boating accidents (in this vessel category) that led to a death had ever taken any navigation training, and only 9% of those were sanctioned courses, and noted that fatal accident statistics have gone down as sanctioned training has gone up over the years. Thus they argued that more navigation training is more important than requiring Rules carriage. This is obviously true, but I must add that the Nav Rules were not designed to prevent fatal accidents, but to prevent collisions, and I state again our premise that the Navigation Rules is the most important book in navigation. They also failed to point out that every collision (between vessels of any size) involves the violation of at least one of the Rules by both vessels involved­—in other words, it is statistically impossible to have a collision if you obey all the Rules, regardless of what the other guy does. But you have to know the rules on what to do when he does not obey the Rules. I agree that it does not make practical sense to extend the carriage Rule to smaller vessels. Furthermore, it does not matter; the Rules must be obeyed by all vessels, regardless of having a copy on board, and in fact regardless of even having read them. I would hope that somewhere in the state boat registration process there is at least a statement saying you must know and obey the Rules. This would be interesting to track down. The requirement for larger vessels (>39ft) on Inland Waters to carry the Rules at least gives mariners a chance to look up relevant rules after the fact as a means of ongoing education. There will always be encounters, lights, or sounds that we wish we knew better at the time. Why there is no similar rule in the COLREGS is beyond US law or USCG control. The international consensus must be that International Rule 1(a) that you must obey the Rules is enough to go with. There are IMO regulations that all commercial vessels must carry a copy of the Rules, but that is independent of the Rules themselves. With all that said, if you did not know about this Rule, do not feel too bad. It was always the law, but it was buried in Annex V, §88.05. Now with the new changes it is up front in Inland Rule 1(g). "Two minutes" is a cake walk with a well designed ebook version (ie Starpath Pocket NavRules) and even trivial with the USCG pdf version that you can mail to yourself and open in your phone. Click the attachment and choose open in iBooks (a free app from Apple), which will save it there. Practice once or twice looking up a rule, and you are always legal. Rule 8(a). Any action taken to avoid collision shall be taken in accordance with Rules 4-19 and shall if the circumstances of the case admit, be positive, made in ample time and with due regard to the observance of good seamanship. They added the precedence statement (shown here underlined) to the inland rule. Also interesting, though not part of the rule itself, this USCG document also effectively defined “in accordance with” by adding this sentence to their description of the rule change: “It is our intent that Rule 8(a) should be taken with full knowledge and compliance with Rules 4–19” (italics added). 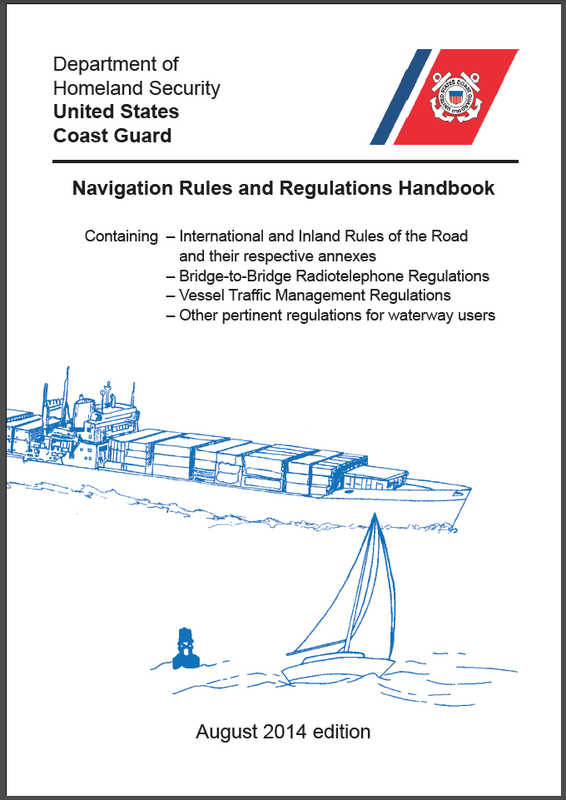 In the previous version for Inland Rule 33(a), it was required to carry a whistle and a bell for vessels ≥ 12m (39 ft), but the International Rules required the bell only for vessels ≥ 20m (65 ft). The new inland rule now matches the International rule, so you do not need a bell on board till 65 ft or longer—so off to the swap meets with these, or make dinner bells at home. A brass bell that meets USCG requirements can easily cost $100. This rule change affects several of the USCG’s trickier license exam questions, so keep in mind an older data set of these questions may now have the wrong answer. The new dataset of Rules questions online have these answers changed. Rule 35(g) and 35(h) in both International and Inland rules calls for ringing a bell when anchored or aground in restricted visibility. The rules do not specify vessel lengths. In the old inland rule you had to ring a bell for 12 to 20m, now you don’t, because you don’t have to have a bell at all. Now you are forgiven for all the times you were anchored in the fog and did not ring your bell! Here we have another seemingly very simple Inland Rule change that has notable implications to sailors of smaller boats, or dinghy rowers running back and forth to larger boats. It is also notable in that it goes contrary to the harmonizing goal of the changes in that it willfully makes a US Inland Rule different from the corresponding International Rule that was previously the same. Rule 25 (d) (i). A sailing vessel of less than 7 meter in length shall, if practicable, exhibit the lights prescribed in Rule 25(a) or (b), but if she does not, she shall exhibit an all around white light or have ready at hand an electric torch or lighted lantern showing a white light which shall be exhibited in sufficient time to prevent collision. The lights of 25(a) referred to are sidelights and a sternlight; the lights of 25(b) are a tricolor on the masthead. They have added the all-round white light option to the Inland Rule, otherwise the two rules would be identical. Now inland-waters boats, under sail or being rowed, that are less than 23 ft (7 m) long can run with a steady, all-round white light. If you choose that option, it definitely means only the all-round white light; no other lights allowed. It also of course means no engine or outboard running, just actual sailing or rowing. So what are the implications of this change? There are certainly a large number of boats in this category that could end up sailing or rowing (ie a dinghy) at night. We still have the previous options of full sidelights and a sternlight, or no lights at all with just a bright flashlight at hand to warn approaching vessels. But now we have a third (Inland) option of a fixed, all-round white light. For many sailboats (again <23ft) you can now sail at night running your anchor light from the masthead—but turn off your sidelights off if you have them. The anchor light was used by some sailboats in the past, but it was not legal then (sidelights and a masthead light looks like a power-driven vessel). Those who knew that may have thought it was better seen than legal, but just like the other common sailboat lighting error of running deck lights and tri-color (also illegal) these lights can get fined. I know of a case from many years ago where a fine for running both tricolor and deck lights was $50. 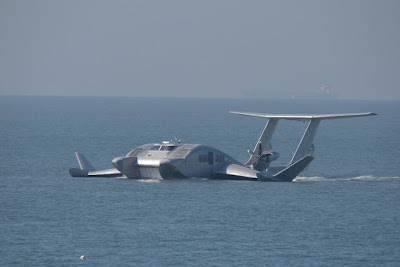 Modern exposure is higher: “A civil penalty of up to $500 may be imposed by the Coast Guard for failure to comply with equipment requirements...” from a USCG Special Notices to Mariners. Frankly, it is unlikely to be fined for just wrong lights, but in the event of a collision at night, illegal lights guarantees you a large part of the liability, regardless of who was at fault. Tech developments that may have impacted this decision are bright LED lights, which even the smallest boat can run for long periods on a small battery. This new rule also now makes the kayaker with a white light on his hat legal as well, which in the past it was not. Granted, you will look like a sternlight, but in principle that would not be a problem. Anyone approaching a sternlight should go around it. At this point we can add that one of the USCG’s stated motivations of the changes (“more public awareness”) has just been achieved—you have read an article on the US Inland Rules! To know where they apply, check 33 CFR Part 80, in the back of the new Navigation Rules Handbook. See a preview of our Starpath Pocket Navigation Rules Handbook for a very convenient presentation of the new rules and all related documents.... or better still, open it in your phone and bookmark it.